MORGAN SILVER DOLLARS FOR SALE! 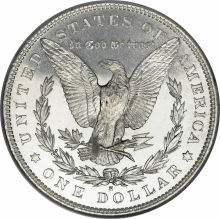 Many dealers and old-time collectors consider Morgan Dollars to be a fail-safe investment because of their still-low prices and affordability. Enough were minted to give every collector a chance to own a few, but full sets are becoming more and more elusive as millions of these beautiful coins were melted in 1918, and then millions more were melted in the great silver melts of the 1920s, 30s, 40s and 60s. 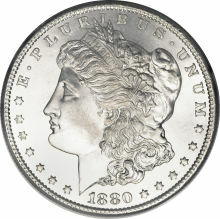 These large silver coins are a favorite among collectors because a complete date set from 1878 to 1921 (not including all mints of every year) can still be assembled in higher circulated grades within the realm of almost every collectors budget. As more new collectors come into the market and graduate from collecting state quarters to these more beautiful and impressive large silver coins, prices should no doubt rise accordingly. Although no one can guarantee what the future holds, we recommend that collections be assembled and put aside now, while prices are still low. 1878 8TF 10,500,000 $60 $70 $85 $90 $110 $185 $225 $465 $1485 $5500 P.O.R. 1878 7TF (Rev.79) $40 $42 $45 $47 $50 $110 $220 $420 $1775 $9750 P.O.R. 1878 CC 2,212,000 $105 $110 $115 $135 $175 $395 $460 $535 $1675 $5875 P.O.R. 1879 14,806,000 $28 $30 $32 $34 $45 $60 $90 $145 $695 $2775 P.O.R. 1879 CC 756,000 $125 $175 $285 $735 $2195 $4250 $7425 $10250 $26900 P.O.R. P.O.R. 1879 CC Capped $130 $165 $220 $575 $1650 $4050 $6325 $9175 P.O.R. P.O.R. P.O.R. 1879 S (Rev.78) 9,110,000 $35 $40 $45 $47 $50 $190 $575 $1425 $5225 P.O.R. P.O.R. 1880 12,600,000 - $35 $40 $42 $43 $50 $80 $130 $660 $2350 P.OR. 1880 CC (Rev. 78) 591,000 $170 $175 $190 $250 $300 $525 $690 $1025 $2050 $5500 P.O.R. 1880 O 5,305,000 $35 $40 $43 $45 $47 $100 $350 $1650 P.O.R. 1882 O 6,090,000 $30 $32 $34 $35 $40 $50 $70 $115 $1395 $7250 P.O.R. 1882 O/S $40 $45 $50 $60 $80 $160 $575 $1725 P.O.R. 1890 CC 2,309,041 $80 $85 $87 $115 $175 $485 $695 $1475 $4450 $15500 P.O.R. 1891 8,693,556 $25 $27 $28 $30 $40 $55 $175 $625 $6150 $12500 P.O.R. 1891 CC 1,618,000 $80 $85 $87 $115 $175 $485 $695 $1075 $4450 $15500 P.O.R. 1891 O 7,954,529 $25 $26 $27 $35 $38 $145 $345 $655 $7450 $14750 P.O.R. We Pay for Shipping | Never Pay For Shipping, Handling, or Insurance Again! We sell coins to the public at wholesale prices. Due to our buying power, we are able to offer great collectibles to you at prices often enjoyed only by dealers. Please bookmark our site and check-in frequently as our offerings grow weekly. Your security and peace of mind are important to us. We accept orders "off-line" by checks or money orders by regular mail at the address below. All sales must be in writing to protect both you and us, as this will minimize mistakes or misunderstandings. We do not accept phone orders. We do not maintain an expensive sales staff, so no one will disturb you with sales calls. All of our sales are strictly confidential, by mail or e-mail. All of our items are guaranteed with a full 14 day return privilege. Click ABOUT US for more information. Questions? Need Help? Write to us at the address below or e-mail: contact customer service Please allow five business days for a response, as we frequently attend most major coin shows throughout the nation. Copyright 1995-2016 by CollectorsInternet.com. All material at this site is copyrighted by CollectorsInternet and may not be reprinted in whole or in part, or stored, or transmitted by any means, including electronic. All commercial use, transmission and reproduction of this site is strictly prohibited by national and international laws. Terms and conditions of sale are subject to change without notice, except our 14 day return privilege and lifetime guarantee of authenticity, provided coins are not removed from their original holders.